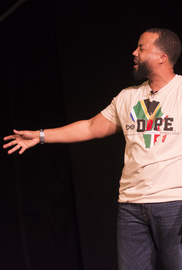 Spoken Word Artist Deonte Scott returns to the stage to give you Damage Control. With the release of his highly anticipated Spoken Word EP Damage Control Deonte performs for a sold out crowd at Houston's Frenetic Theatre! He takes the crowd on a journey of his first Spoken Word Album "The Struggle" and introduces the audience to the new material before the show is over. Deonte used this platform to give back a portion of the proceeds to the Ronald McDonald House of Houston. You are in for a treat as the spoken word artist takes you on a journey called Damage Control.